Do you want to give a SURPRISE GIFT, but you don't have the best photos? 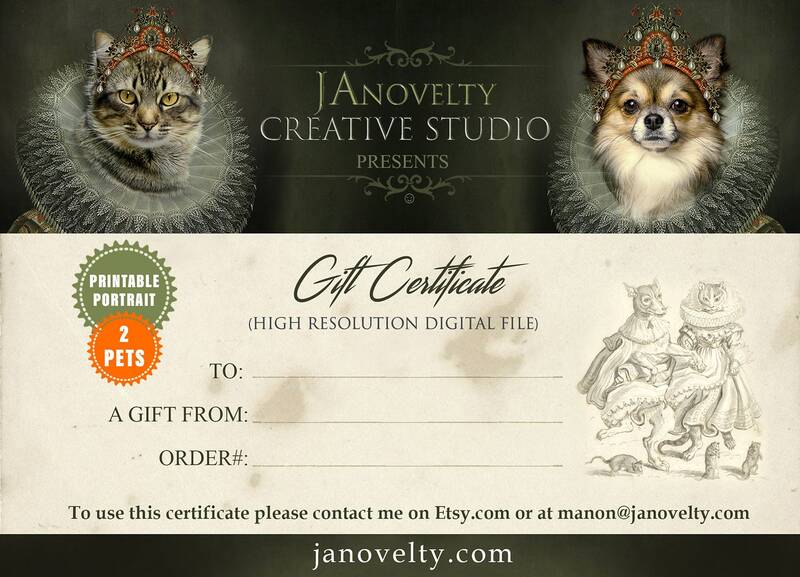 Order a Gift Certificate for a Digital Custom Pet Portrait for your pet loving friend or family member! 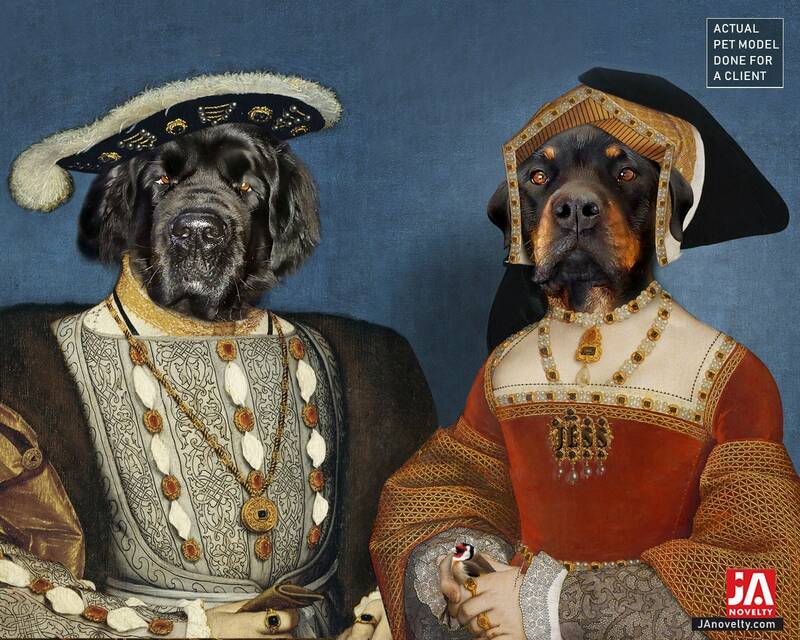 It will show the royal side of your pet by blending your pet's face with a historical background. Everyone will have a good laugh and the owner will smile every time it will pass by the room. Please tell me your name and the name of your pet lover at checkout. In maximum 24 hours after you place the order, you will receive a digital file in PDF format. You can print it or send it electronically to your friend. Your friend can contact me here on via email at manon [!at] janovelty.com with the certificate number and the pictures of his/her pets. - The certificate owner can upgrade the size or request multiple characters and pay only the difference in price. - Price protection: this certificate is valid even if prices in my shop are going up. - If the prices are lower when you redeem the certificate I will offer you something of equal value (or more), such as an increase in size or additional customization. - Valid only in this shop. Cannot be used on other Etsy shops or anywhere else. - Cannot be exchanged for cash. - This listing is for A DIGITAL PORTRAIT. YOU WILL NOT RECEIVE A PHYSICAL PORTRAIT. 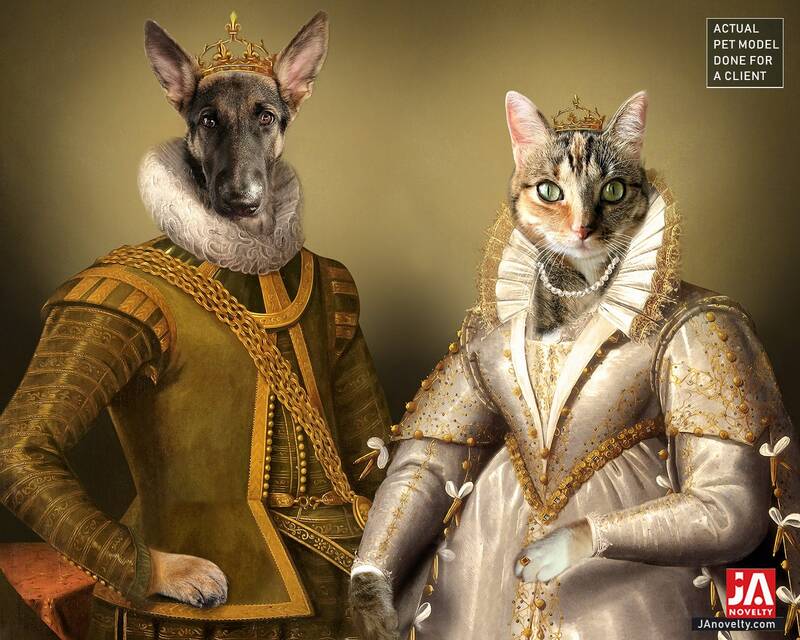 - It will look best when printed on high-quality canvas or paper at the size specified in the order. I will work on orders in first-come, first-served mode. I will start to work at this item only after I receive the pictures from the pet owner and only if the quality is good enough. You can see the delivery time in the actual listing for the portrait, at the time you redeem the Gift Certificate. PLEASE DO IT EARLY TO RESERVE YOUR SPOT IN MY QUEUE. For any questions send me a message here or at manon [!at] janovelty.com.